The traditional 12 inch pre-seasoned cast iron skillet get a facelift! There is something special about the tradition and essence of a good round cast iron skillet. Why not take that, and make it even better? Our high quality cast iron skillets have just enough "smart" innovation to make them more functional while remaining true to tradition. Get a SAFER handle on heavy things: Victoria Cast Iron handles are curved, bigger, more ergonomic, and quite frankly, more beautiful too. Get a better grip while handling your hot iron, whether in the grill, campfire, oven, or stove. A cast iron skillet with longer & curvy handles doesn't just translate to better maneuverability, but also to cooler handle temperatures on the stove (protective gear is still always recommended for iron products). Keepin' it Natural: Victoria Cast Iron skillets have been praised by chefs and professional testers for their excellent flaxseed pre-seasoning right out of the box! Extensive tips on maintaining and building seasoning are found on the packaging and our website. Multi-Functional, Multi-Faceted: Bake in it, Fry in it, BBQ in it. The Victoria Die Cast Iron Skillet is suitable for cooking in: induction, ceramic, campfire, grill, oven, & more. And to top it off, our skillets are deeper and have a wider cooking surface, allowing you to sear, bake and fry better. Zero Waste! Our clean and efficient factory is virtually zero waste. Our skillets are made from recycled cast iron that is melted at ultra high temperatures and then completely purified to is rawest form, bringing it back to its roots. Why you’ll love it: our pre-seasoned Cast iron skillets have Curved Handle for Leverage. We also purposefully created Contoured cast iron Pour-Spouts that actually catch drips. Victoria cast iron skillets have Wider Helper Handles and Longer Handles – and have holes in the handles that are big enough to hang on thick hooks. 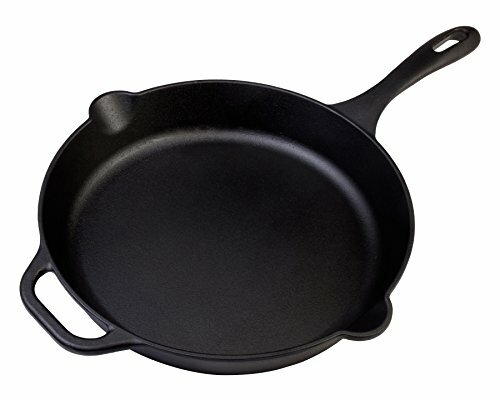 Our cast iron is Preseasoned with only the best 100% Non-GMO Flaxseed Oil. Our cast iron pans are so beautiful you will love taking it straight from oven to table. If you have any questions about this product by Victoria, contact us by completing and submitting the form below. If you are looking for a specif part number, please include it with your message.